Cooking always requires the transfer of heat from a heat source to the food being cooked. All cooking methods can be divided into one of two categories: moist-heat or dry-heat. Understanding how each process works will help you determine which cooking method is most appropriate for the results you are trying to achieve. In moist-heat cooking methods, liquid or steam is used to cook the food. Flavored liquids, such as broth or wine, can be used as the heat transfer medium and will also add flavor during the cooking process. Leftover liquids from the cooking process can also be used to make sauce or stock. Blanching involves dropping food into boiling water briefly and then immediately halting the cooking process by submerging the food into ice water. Blanching is used to loosen the skin on fruit and vegetables and to halt enzymatic action that causes fruit and vegetables to deteriorate. Fruit and vegetables are often blanched prior to freezing to maintain their color and freshness during storage. 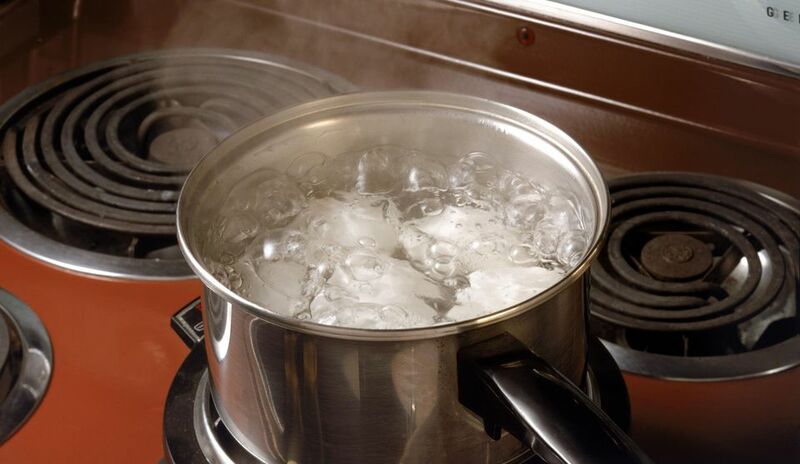 At sea level, water boils at 212 degrees F. Boiling water has large, vigorous bubbles, which can disrupt or damage delicate foods. Boiling is used to cook stronger, hearty foods such as beans, pasta, or tough vegetables. Because of the high heat involved, boiling is usually a relatively quick cooking method. Braising involves simmering large cuts of meat in a small amount of liquid in a covered dish. Keeping the braising dish covered traps moisture within and helps intensify the flavors. Liquids used for braising are often wine, stock, or the meat's own juices. Partially or fully submerging food into water or another liquid that has reached 160 to 180 degrees F is called poaching. Water at this temperature is hotter than scalding but is not vigorously bubbling like boiling water. This allows for delicate foods to be cooked without being disrupted or damaged. Poaching is often used with eggs and fish, both of which would break apart if exposed to rapidly boiling water. Water that has reached 150 degrees F is considered scalding. At this temperature, water will have bubbles attached to the side or bottom of its container that does not release or move as they do with simmering or boiling water. The scalding technique is sometimes used to help solids, such as sugar, flour, or chocolate, dissolve more easily into the liquid. Scalding was also used in the past to kill bacteria in milk before pasteurization was so prevalent. Simmering liquids are above 180 degrees F but not vigorously bubbling like boiling water. Simmering liquid has gentle bubbles that rise swiftly from the bottom of the pot. Simmering is a more gentle cooking method than boiling and is often used for long and slow cooking processes because there is less evaporation than with boiling. Tough meat, soups, and stews are often simmered over low heat for long periods of time. Steaming involves the transfer of heat through vaporized water or other liquids. This is by far the most gentle moist-heat cooking method. Because food is not allowed to steep in the hot water, steamed food retains more nutrients than food that is boiled or simmered. Pressure cookers utilize steam and pressure to increase the cooking temperature above the boiling point of water. Stewing is similar to simmering in that the liquid is heated until it forms gentle, yet quickly moving bubbles. The difference between stewing and simmering is that stewing generally involves a much smaller amount of liquid that is retained and served with the food as a sauce. Stewing is great for softening tough cuts of meat or fibrous vegetables.